The United States Mint will be releasing the 2010 US Mint America the Beautiful Quarters Silver Proof Set this Thursday, May 27, 2010 at Noon (Eastern Time) to anxious collectors who have been awaiting the set's availability. This release marks the second set from the Mint to include coins of the new America the Beautiful Quarters Program, which debuted earlier this year. The first set was the 2010 US Mint America the Beautiful Quarters Proof Set which was released on May 13th. Details for the official release ceremony of the 2010 Yellowstone National Park Quarter (marking the second issue of the America the Beautiful Quarters Program) have been announced by the US Mint. The ceremony is scheduled to occur on June 3, 2010, beginning at 10:30 AM Mountain Time. 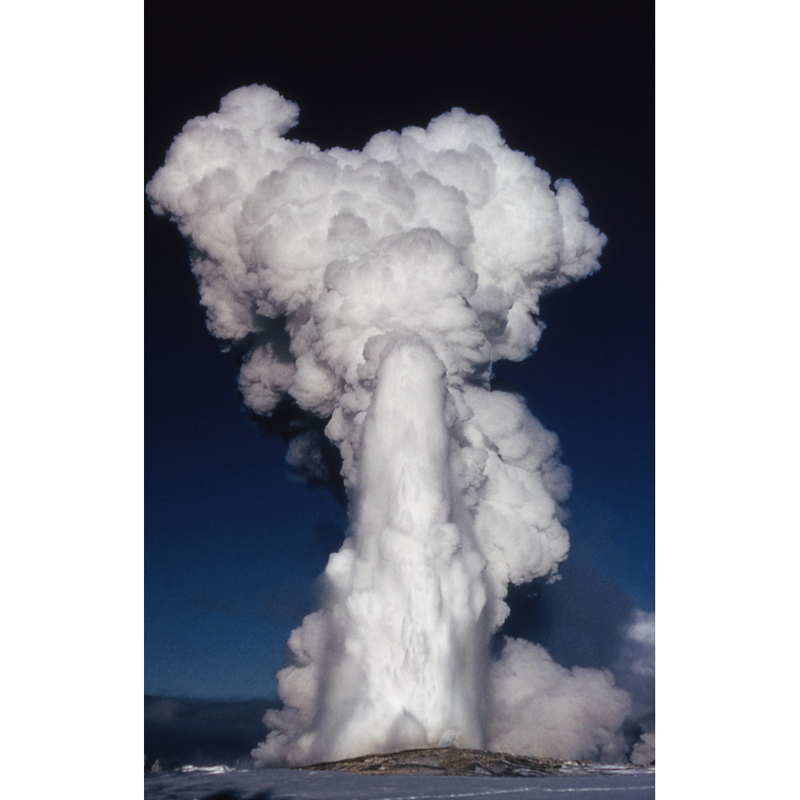 It will be located in Yellowstone National Park at Old Faithful Inn. Collectors wanting to get their hands on a version of each of the first five strikes of the new America the Beautiful Quarters Program now have their first opportunity. 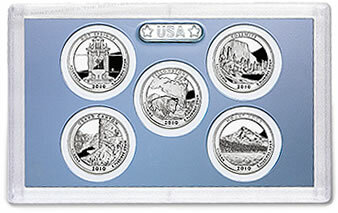 Today, the US Mint released the 2010 America the Beautiful Quarters Proof Set. 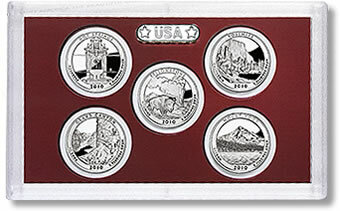 Included in the set are proof examples of the Hot Springs National Park Quarter, the Yellowstone National Park Quarter, the Yosemite National Park Quarter, the Grand Canyon National Park Quarter and the Mount Hood National Forest Quarter representing Arkansas, Wyoming, California, Arizona and Oregon, respectively. 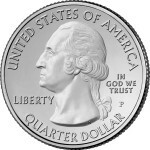 Up until now, the only 2010 quarter available to the public was the Hot Springs strike which debuted in circulation quality last month on April 20, 2010. The next single quarter dollar to become available is the Yellowstone strike due out on June 1. The premiere of the America the Beautiful Quarters Program, the 2010 Hot Springs National Park Quarter, had an official launch yesterday (April 20, 2010) by the US Mint. Held on the grounds of the headquarters building of the park, the release ceremony was hosted by US Mint Director Ed Moy. He was joined at the occasion by National Park Service Midwest Regional Director Ernie Quintana and Hot Springs National Park Superintendent Josie Fernandez. 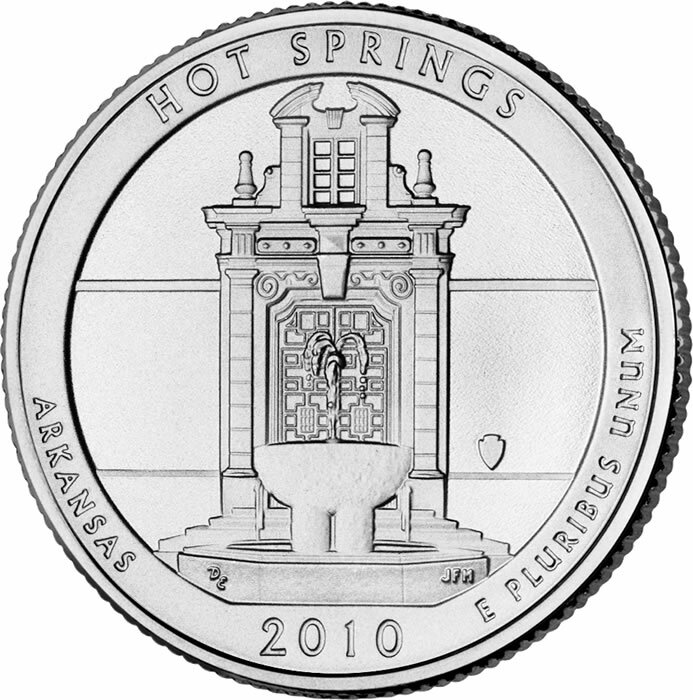 The US Mint has announced that it will join National Park Service officials in launching the 2010 Hot Springs National Park Quarter on Tuesday, April 20, 2010, at 10 a.m. Central Time. The release will introduce the nation to the first of 56 coins in the America the Beautiful Quarters™ Program -- the latest series from the United States Mint which will honor sites in every state, the District of Columbia and each U.S. Territory through to 2021. The United States Mint formally unveiled the final designs for the upcoming 2010 America the Beautiful Quarters Program strikes last week in a short ceremony held at the Newseum in Washington, D.C.
At the ceremony, Mint Director Ed Moy was joined by Secretary of the Interior Ken Salazar, U.S. Representative Mike Castle, U.S. Treasurer Rosie Rios, writer and producer Dayton Duncan and Under Secretary for Natural Resources and Environment Harris Sherman. The United States Mint has announced that the first offering in the America the Beautiful Quarters Program will be available for purchase beginning next month. 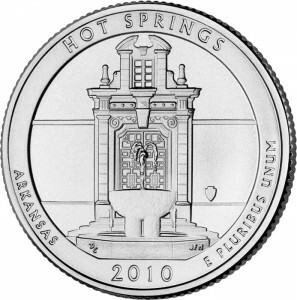 The Hot Springs National Park Quarter will be sold in rolls and bags by the Mint beginning at Noon Eastern on April 19, 2010. That date also marks the first day the quarter dollars will be allowed into circulation through the Federal Reserve System and your local bank. The long wait for the final design selections on the upcoming 2010 America the Beautiful Quarters is about to be over. 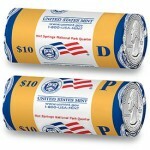 The US Mint has announced that they will be holding an unveil ceremony on March 24, 2010 at the Newseum Museum in Washington, DC to introduce these new designs to the public. Ever since they were first authorized for production a couple of years ago with the America's Beautiful National Parks Quarter Dollar Coin Act of 2008, collectors have been speculating on the possible designs. Last year the Mint released the final site list containing all 56 chosen locations that will be featured over the next 11 years. The Citizen's Coinage Advisory Committee (CCAC) met this morning (January 26, 2010) in Washington, D.C. for the express purpose of reviewing design candidates for the 2011 America the Beautiful Quarters to be issued next year. The series, which launches this year with five new quarters, pays tribute to one site of national interest (usually a national park or forest) from each state, Washington, D.C. and the five U.S. territories. It is set to run until the year 2021, when the last of the 56 new quarters will be issued. For the first program, the Mint will strike circulating quarter-dollars with reverse (tails side) designs emblematic of a national park or other national site in each state, the District of Columbia and U.S. territories. "Since our Nation's founding, our coins have celebrated American ideals such as liberty and justice, our rich history and heritage, and the great Presidents and other leaders who have guided us," Secretary of the Interior Ken Salazar said in a US Mint announcement. "I am pleased that these new quarters will now celebrate America the Beautiful, the spectacular natural wonders that are found in our national parks, wildlife refuges and public lands." 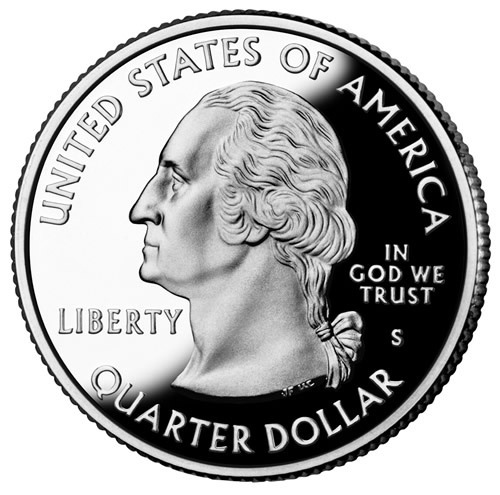 The obverse (heads side) of each quarter will depict a restored version of the 1932 portrait of George Washington.